President Paul C. Johnson and his wife, Elyse. On June 1, 2015, the Colorado School of Mines Board of Trustees announced the appointment of Paul C. Johnson as the 17th president of Colorado School of Mines. He officially assumed his duties on July 1 and currently resides in the President’s House on campus with his wife, Elyse. Johnson joined Mines from Arizona State University, where he served as dean and executive dean of the Ira A. Fulton Schools of Engineering. Two weeks before the start of the fall semester, the editor of Mines magazine sat down with President Johnson for a Q&A interview to help alumni readers get to know the new president on a personal level. MINES: What were your first impressions of Mines? JOHNSON: I’ve had multiple first impressions of Mines. The initial one occurred when I began working in the oil industry that one was a distant impression of a specialized, highly technical and smaller university that produced great people in geology and engineering. My next first impression came 30 years later when talking with the search firm and the Board of Trustees and reading the strategic plan. That new first impression was that Mines is an institution that’s really eager to take another step in its evolution. You can trace the history of Mines and see steps along the way. The most recent step has been a physical transformation of the campus, and to some extent, a transformation of the demographics of the faculty. So, the impression that I got before ever stepping foot on campus was that it’s almost like somebody has built a new car, it has a great team built around it, and now they’re ready to go someplace. Then I came and visited the campus, and the impression was that of a really close-knit community and a very engaged and passionate alumni base, just a group of really nice people who care a lot about the institution. What I kept getting was a sense that this is a place that’s eager to have its next leader and eager to work with that person to develop and implement the vision for the next decade. MINES: How did those impressions play into what motivated you to apply for the position? JOHNSON: The thing that really hooked me was that when people read the position description, their first comment to me was, they wrote that position description about you. I kept getting that feedback from people. The match was just sort of eerie. Then I looked at the Strategic Plan, and I liked what I saw, in terms of its format and the content. You can sense the core values of an institution when you look at the materials they produce. And you can see that Mines is very student-centric, which is very important to me. It’s an institution that’s trying to elevate its profile in the world, as well as increase the impact and scale of its research enterprise the discovery and innovations. That was something that appealed to me a lot. Incoming freshman got a pleasant surprise when new Mines president Paul C. Johnson joined them for the annual M Climb on August 24, 2015. I love helping students develop, and I love helping faculty develop, and you can tell that there’s this group here that is ready to take the institution to the next level. So, that was the big attractor to me. And then, of course, all of the other things that come along with that were bonuses. Elyse and I had always said that if we were to ever leave ASU, it would have to be for an opportunity in the West, it would have to be a smaller institution that really cares about students and is interested in changing and evolving, and it would need to be located in a college-town atmosphere. Mines clearly checked every one of those boxes. Finally, I just realized that this might be a once-in-a-lifetime opportunity. MINES: What will you miss most about living in Arizona? JOHNSON: For nine months of the year, the weather in Arizona is fantastic. Like Colorado, there is a lot of natural beauty there, if you know where to go to find it. But at the top of the list of things I’ll miss most are the people I worked with there. MINES: You’ve enjoyed the warm climate of Arizona for quite some time. Does Colorado winter make you nervous? JOHNSON: It did when we were first thinking about coming here. When I came for my first interview in late February, that day there was a huge snowstorm in Denver. The snow was piled up everywhere, and I was thinking, “Oh no.” But we are really looking forward to experiencing seasons. MINES: When you were a college student, who was the most influential person in your life? JOHNSON: In terms of making me realize that being an engineer was for me and getting me interested in education and teaching, it was definitely Steve Whitaker, one of the faculty members at University of California-Davis from my undergraduate days. He showed me that you could solve very abstract problems, as long as you were methodical. He had a great presence in the classroom, but he was not intimidating at all. The really cool thing for me was that he wore blue jeans, and I decided I wanted a job where I could wear jeans all the time. MINES: What is the best advice you ever got? JOHNSON: Choose to work with people who are really positive and forward-looking. People sometimes aren’t happy about something, and they want to talk about what happened last week or two years ago. I like to be around people who have fun and are creative, so one piece of advice I got was to basically surround yourself with people like that. Don’t be afraid to take risks and fail has always been a good piece of advice as well. And make sure you’re having fun with what you’re doing. If you’re not having fun, you’re probably not in the right place or position. MINES: What would people be most surprised to know about you? JOHNSON: From an academic standpoint, for some reason people have always been somewhat surprised at how much I teach and how much time I’m willing to devote to being accessible to students and faculty. Most people have this misconception that the higher up you get in a university, the more disengaged you are from the basic function of the institution. Sometimes when I tell faculty members that I teach three classes, their jaws drop. I’ve always had this rule that to be happy over the course of a week, I need to average about 30 minutes a day interacting with students in some way. Because really, that’s what we’re all about here. President Paul C. Johnson welcomes students at the Fall 2015 Convocation. JOHNSON: I know I’m inspired if I do something and then come away being really excited. The thing that always does it is helping students, interactions with students and learning what they’re really interested in doing. Faculty always inspire me, particularly the ones who are very creative and entrepreneurial and share the same love for students. Then there are the Mines alumni. In early August, I came away from the Houston alumni event just totally fired up. The event was supposed to go from 6 p.m. to 8 p.m., but we were there until 10:30 p.m., the security guards had to kick us out. It’s very easy to be really excited about Mines when you spend time with the students, faculty, and alumni. You can’t help but be inspired by that. MINES: Do you have a Colorado “bucket list”? JOHNSON: The list keeps growing, because I keep asking people what to do in Colorado. I’m certainly looking forward to all the Mines traditions, like the M Climb. I also love backpacking and hiking, so I’d like to do some or all of the Colorado Trail. Other things on my list are: going to a concert at Red Rocks, tubing or kayaking on Clear Creek, and seeing Blaster in person. And we keep hearing about bears, so we want to see a bear in Colorado. President Paul C. Johnson talks to incoming freshmen at the Denver Welcome Party, held on August 3, 2015, at Coolbaugh House. MINES: What is the most memorable conversation you’ve ever had with a student? It wasn’t a big deal for me to spend a couple minutes talking to this young man when he was a freshman, but it made a huge difference to him. So, I guess the moral of the story is to never forget that a small gesture can make a big difference to someone. MINES: What do you see as the biggest challenge facing college students today? JOHNSON: If there was a short list, affordability would certainly be one of them. In the face of declining public support, more students are working significant hours and are unable to devote the time needed to their studies. The ubiquitous availability of information is another challenge, some students assume that the answer to everything is already somewhere on the internet and will spend hours looking there, rather than spend the 30 minutes needed to work through a problem. On the plus side, today’s students are more likely to be actively engaged in their education. They tend to be more entrepreneurial, and they are fairly good communicators when they come in. Creating ever-evolving learning environments that recognize these challenges and build on student strengths and interests is key at Mines. 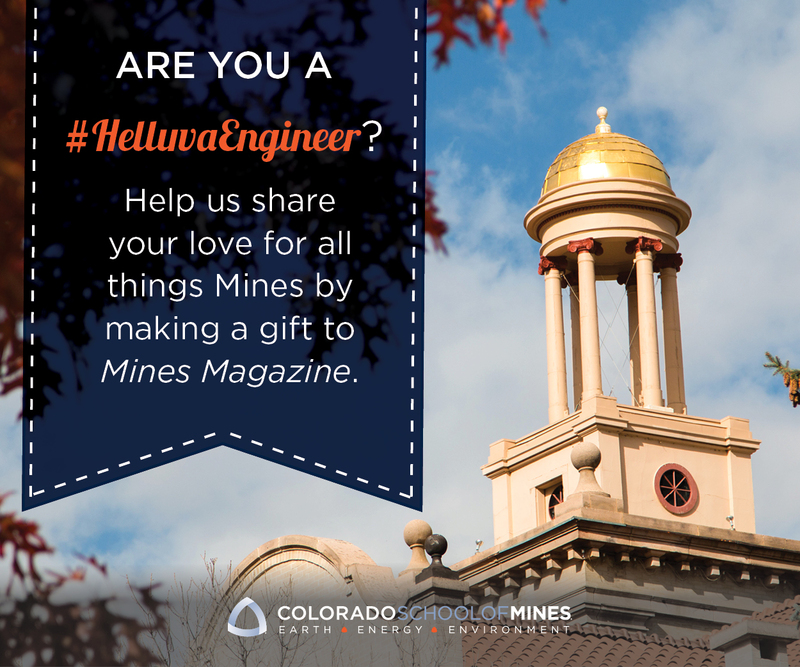 MINES: What are you most looking forward to about Mines and the Golden community?